Which bonus will you choose? Keep reading to discover more about GTBets. For sports bettors, you receive five points per $10 wagered on sports, two points per $10 wagered on baseball, and 7.5 points per $10 wagered on horse racing. A deposit of at least $35 is required to trigger either bonus, with the maximum deposit being capped at $1,000. All three major credit cards - Visa, MasterCard and American Express - are available to make deposits at GTBets and each of them comes free of fees. Pre-paid gift cards, Bitcoin, Neteller and Skrill/Moneybookers are also free of charge when you opt to deposit via these options. DirectCash and QuickCash are both options that incur $10 fees if the deposit is less than $200. For deposits of $200 or more, no fees are incurred. 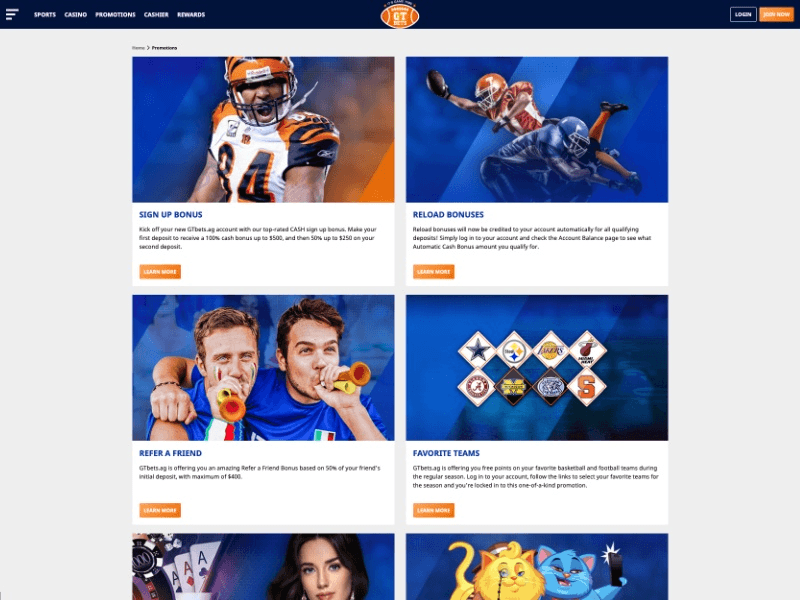 GTBets may have only been established in 2011 but they have already made big waves in the sports betting community thanks to their lucrative bonuses and innovative promotions, including the favorite teams promo. The GTBets website is fresh and pleasing to the eye. From the color scheme to the fonts used, everything just works. You’ll also be pleased to learn that their website is also very responsive, with pages loading up in a couple of seconds. The different betting markets, of which there are dozens, are extremely easy to navigate through, meaning you’ll be wagering within a few clicks of your mouse. Both deposits and withdrawals from GTBets are nice and quick, and it is possible to bet in real time thanks to the live betting option that has grown in popularity over the years. Now odds are updated continuously on your game. Finally, you will never miss an opportunity to place a bet ever again thanks to the’ superb mobile betting platform at GT Bets, which is available on Android, iOS and Blackberry powered devices, giving you the ultimate in flexibility when it comes to placing a bet. Choosing the 100 percent up to $250 bonus will yield a minimum bonus of $35 and a maximum of $250, while the 50 percent bonus up to $500 has a minimum of $17.50 and a maximum of $500. The minimum deposit for either bonus is set at $35. Both welcome bonuses have a 5x point rollover system in place, and you must rollover both the bonus and deposit amount. Rollover points are accumulated for every $10 wagered, with five points awarded for betting on most sports except baseball, where you earn two points per $10 wagered. Betting on horses awards 7.5 points per $10 wagered. GTBets is the place for your horse racing bets because they offer a 15 percent rebate on your losses on the first day of every month. These rebates do not apply to horse futures, propositions, matchups, fixed odds markets, or weekly contests and are awarded for wagers placed online only. Bonuses awarded are deducted from your losses when figuring the 15 percent rebate. For example, deposit $500 and receive a $50 bonus, so your starting balance is $550. Over the course of the month you bet on horses and end the month with a balance of $300. Your losses for the month are $250. After deducting the $50 bonus, your net losses are $200 so you would receive a $30 rebate into your account. There is no need to remember any bonus codes to claim your bonuses at GTBets. Simply check your account for any bonuses that you are eligible for and follow the simple on-screen instructions to get your hands on them. Casino Wins – Casino Losses – Bonuses = Rewards Cash – Rebates = Casino Loss. Whatever your Casino Loss is, you receive 10 percent of it back, unless you are a winning account during the past 30 days or over the lifetime of your account. At time of writing, GTBets does not offer its customers online poker. This is not to say they will never have an online poker client, but for the time being the company is focussed on sports betting, horse racing, and casino games. Withdrawals from GTBets are processed Monday through Friday between 10 a.m. and 4 p.m. (EST). If you choose to receive your payout via QuickCash, DirectCash or Back2Card then you will see your funds within 72 business hours. For DirectCash and QuickCash, there is a minimum withdrawal amount of $50 and a processing fee of eight percent. The most practical option is to utilize Back2Card, which has a minimum withdrawal amount of $15 and a 1.5 percent processing fee. Bank wire and check by courier are also available, but the processing fees are pretty high at $60 and $49 respectively. One of the drawbacks to the withdrawal system at GTBets is that if you made your initial deposit using a MasterCard or Visa, then you are required to make your first two withdrawals via bank wire. After that, you are free to utilize the Back2Card method. Deposit bonuses aside, GTBets has some superb promotions that you are invited to take advantage of. One such promotion is an automatic reload bonus on all deposits ranging between five percent and 50 percent. Simply log into your GTBets account, check the Account Balance page and see which automatic cash bonus you qualify for when you next make a deposit. Another value-packed promotion is the favorite teams gimmick. This is where you get to choose your two favorite NFL and NCAA football teams, and your two favorite NBA and NCAA basketball teams and receive ½ point free on all of their games. For example, if you selected your favorite team as the Miami Dolphins and they are favoured at -3, you’ll be offered the line at -2.5. This could make you a lot of money over the course of a season, but choose your teams carefully because you’re locked into them for the entire season. Once you have discovered what makes GTBets great, refer your friends to the site and you can claim up to 50 percent of their initial deposit up to $400! With your GTBets wagering account, you are entitled to become a member of their GameTimeRewards program. GameTimeRewards is unique in the fact that it allows members to earn points on all casino, sports and horse wagers. Points may then be redeemed for great prizes. The offers range from free wagering cash, discounts on airline flights, or your choice of fine wines and cigars. What's your fancy? Take your pick, because the choice is up to you. Close Visit GT Bets and see for yourself... Ok! Let's Check Out GT Bets!